L'Amuse Chez Kate is situated in a small village on the Gower Peninsula called Penmaen overlooking the breathtaking Three Cliffs Bay. 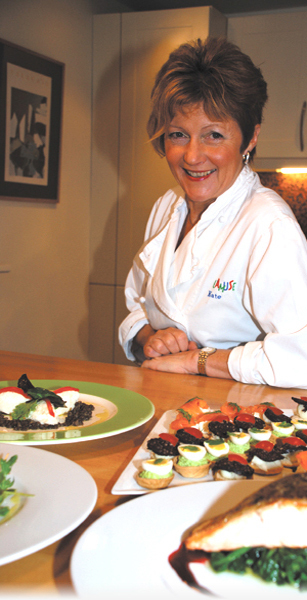 Kate opens the doors of her home where you will be guided through the cookery course, sampling the delights of your creations whilst taking in the anecdotes and worldly experience of Kate's extensive international catering career. Welcome to "L'Amuse Chez Kate" where indulgence in fine cuisine is the order of the day. Whether you are a confident chef or shy cook, L'Amuse Chez Kate offers contemporary culinary courses to suit your requirements and equips you with the knowledge, guidance and expertise to perfect and progress your cookery skills. Thank you for a wonderful day, such a memorable experience. We really enjoyed the whole thing and really feel that we learnt so much, which we intend putting into practice. Hopefully we will come again - our thanks for such a great day to you and to Clive . Many thanks Kate, I really enjoyed it and spent yesterday evening on a quest to find the pasta machine. it was located next to my unused “blow torch” which I am now minded to point at a defenceless creme brûlée! Off to Sainsburys now to locate some ingredients. Thanks Kate. I had a wonderful time and will definitely book another course . Thank you it was so lovely meeting you and Clive and having such great hospitality in your beautiful home, we definitely will come again. Thank you for a most enjoyable day of cooking and tasting yesterday, thoroughly enjoyed the day going so quickly will be experimenting with your recipes and techniques. Hi Kate Thank you so much for a great day on Saturday, we had such a lovely time and it was so nice to meet you and spend time with you. We will definitely be back for more :) Looking forward to your new book - please keep in touch! Trust you are relaxing with Clive over a couple of glasses of wine, and all the washing up has been done and neatly put away! Thoroughly enjoyed yesterday learning more culinary skills, and the hospitality in your lovely cottage was second to none...…...Will certainly book another L’Amuse day before Christmas - in fact I am already looking forward to a it.C’est tres bien! It was so lovely to spend time with both you and Clive again in your beautiful home. You are so much fun, it is pure theatre watching you cook such delicious food....Christy thoroughly enjoyed the day too and has taken away new ideas and lovely memories. Thank you for a very entertaining and informative day and allowing us into your fabulous home with wonderful views. Hope to see you again.